Sweltering Baltimore area summers will keep your cooling system working hard. Unfortunately, its on the hottest days when your A/C system is working the hardest that parts start to fail. We don’t want that to happen. We recommend routine maintenance as the best way to prevent avoidable breakdowns. 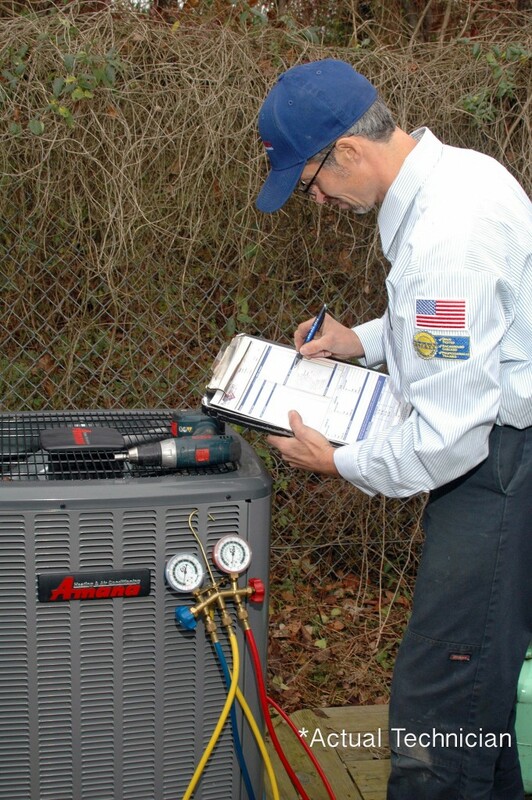 Our 80-point system evaluation and safety inspection includes 29-safety inspections, in which our technicians test, clean and maintain your system. Afterwards, our technician will go over their findings to make you aware of any parts in poor condition or potential problems, so you’ll experience fewer breakdowns and reduce the risk of being without A/C on the days you need it most. Routine maintenance has other benefits such as improving indoor air quality and keeping your unit running at peak efficiency saving you money on your utility bills. Keeping your system maintained is also the most effective way to extend the life of your air conditioning unit. If our technician does find any potential problems or repairs, we always get your approval before doing any additional work. All of our repairs have Upfront Pricing, so you know upfront exactly what the repair will cost. That means you never get hit with a unexpected bill. Want a no-hassle and worry-free solution to regular maintenance? Then one of our Protection Plans is what you’re looking for. Most customers find that it actually costs less to be on a maintenance plan than to schedule yearly maintenance separately. What makes our Protection Plans Worry-Free? We get it, the to-do list for your home is never finished. Ours isn’t either. So why not let us worry about the needs of your comfort system. We will keep track of when your system is due for maintenance and give you a courtesy call reminder. Also, our maintenance plans never automatically renew. Each year we will send you a new service agreement so you never have to keep track of your renewal date and renewing is always in your control. Being a member includes other benefits like priority service with guaranteed appointments in 24 hours or less and discounts on future HVAC installations and indoor air quality services. You can even upgrade to include discounts on repairs and discounts or complimentary service evaluation fees. Think one of our Worry-Free Protection Plans may be right for you? Find out more about how we can make your maintenance convenient and hassle-free.